Savenger hunts are always fun aren’t they? 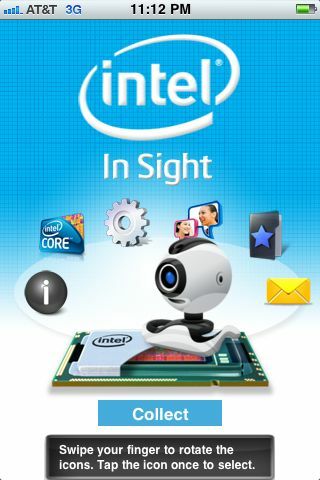 but with the advancement of technology scavenger hunts have even changed to the point where you don’t need to get out of your char and look around for the goodies, just download an application from Intel and use that application to search for hidden points hidden inside Intel Ad’s, Currently this is only open to iPhone users and they are instructed to download an App called “Intel InSight” which uses your iPhones camera to take pictures of Intel Ad’s and hidden within those ad’s are hidden points (Da Vinci code dejavu any one?) and the person who racks up the most points can win a free Core i5 Laptop and runner up prizes are Best Buy gift cards ranging from $250, $100 and $25. Although other smartphone owners can take part in this hunt by simply texting “Core” to 6174604517, Intel has not told us of any other application which can be used in this competition aside from the one made specifically for the iPhone, so maybe other smartphone platforms like Android and Symbian will have to message the number and download the application via their phones.